Laminated Beam Vertical Cold Press for the production of straight or preloaded curved beams of Glulam. Laminated Beam Vertical Cold Press is designed for the production of straight or preloaded curved beams of Glulam. The press, depending on the configurations, has the capacity for up to 60' long material and includes automatic side pressure bars for consistent stock alignment. The system centers on a new modular vertical laminating press that can be expanded to offer various lengths and widths. Multiples of these linear presses can be fit side by side to allow the varying levels of production capacity needed, and the system can be designed with levels of expandability in mind for future growth. 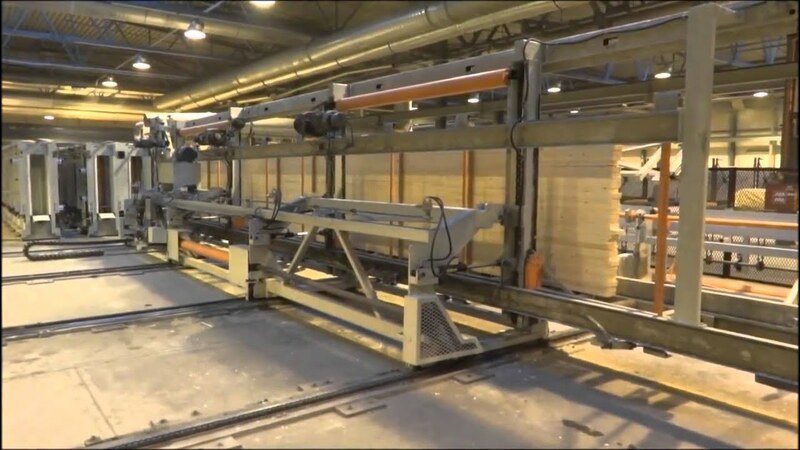 The fully automated system incorporates five stages: loading magazine, infeed shuttle delivery system, laminating press, exit shuttle system, and horizontal outfeed conveyor. Individual boards in a linear line pass through glue application and enter the magazine or accumulator. The accumulator is tilted to its side in this stage and is loaded from the top side. The magazine has adjustable lateral guides to set the beam width. As each board is added, the magazine indexes down to receive the next piece, until the process is finished. The magazine then lifts to a vertical position and shuttles to the awaiting vertical press. A pusher arm built into the magazine drives the parts into the vertical press and is assisted by press feed rollers or chains in loading the beam. The press cycle consists of bringing in the side pressure bars to keep the beam straight and activates the hydraulic cylinders to apply pressure. After the beam is cured, it exits inline to a discharge shuttle that lowers the beam to horizontal and delivers it to the outfeed conveyor for processing. Due to the design of the system, some components can also serve a dual purpose such as the infeed shuttle. 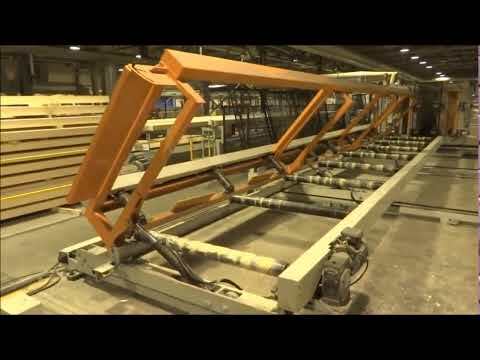 Instead of the press feeding out the opposite end, the system can be set up to feed back in the direction it was loaded in, to the delivery shuttle. The entire system is modular and can be designed for multiple scenarios.